George Smart was born in 1774 and died a pauper in Frant, Sussex in 1846. During these years he served as a soldier, worked as a tailor, got married and raised a daughter. He also created unique artworks that are recognised as hugely important within the idiom of English Folk Art. 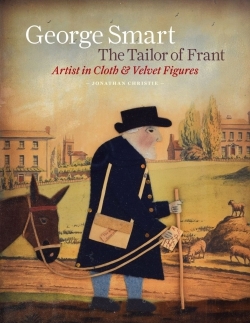 Yet there are no books dedicated to his life and work.In the summer of 2014 however, the spotlight finally fell on George Smart when 21 works by him appeared alongside other non-academic artists such as the Cornish painter Alfred Wallis and the embroiderer Mary Linwood, in the Folk Art exhibition at Tate Britain, London. This unprecedented exposure to a global audience sparked a huge interest in this imaginative and entrepreneurial artist.Despite the extent and assured attribution of his body of work, we actually know very little for sure about George Smart, the Tailorof Frant. Where he lived, the materials he used and the subjects he chose, sketches an impression of his genius loci; whilst the consistency, the quality and the quantity of his work, helps to add texture to this life imagined.The rest however-his motivation, his personality-is guesswork as, like most ordinary working men, his documentary footprint is almost non-existent.His silent artworks are all that speak for him now.Following in the successful footsteps of Alfred Wallis: Cornish Primitive Painter, the first of Unicorn Press's books on Folk Art. Jonathan Christie is an artist and designer. He has exhibited his artworks throughout Britain and sold over 100 paintings anddrawings. He has worked as an Art Director at the Radio Times and The Independent on Sunday and currently is the Creative Director at Octopus Books in London. He first discovered George Smart's work whilst at Art School and has been an admirer ever since. Jonathan lives in Frant-a few hundred yards from the site of Smart's house-with his family.